This volume examines the ethical issues generated by recent developments in intelligence collection and offers a comprehensive analysis of the key legal, moral and social questions thereby raised. Intelligence officers, whether gatherers, analysts or some combination thereof, are operating in a sea of social, political, scientific and technological change. This book examines the new challenges faced by the intelligence community as a result of these changes. It looks not only at how governments employ spies as a tool of state and how the ultimate outcomes are judged by their societies, but also at the mind-set of the spy. In so doing, this volume casts a rare light on an often ignored dimension of spying: the essential role of truth and how it is defined in an intelligence context. This book offers some insights into the workings of the intelligence community and aims to provide the first comprehensive and unifying analysis of the relevant moral, legal and social questions, with a view toward developing policy that may influence real-world decision making. 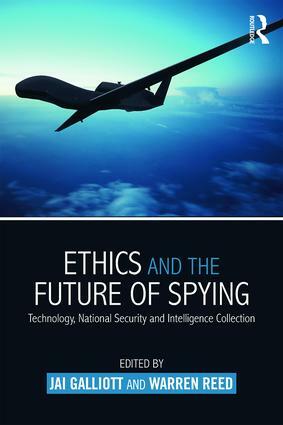 The contributors analyse the ethics of spying across a broad canvas – historical, philosophical, moral and cultural – with chapters covering interrogation and torture, intelligence’s relation to war, remote killing, cyber surveillance, responsibility and governance. In the wake of the phenomena of WikiLeaks and the Edward Snowden revelations, the intelligence community has entered an unprecedented period of broad public scrutiny and scepticism, making this volume a timely contribution. This book will be of much interest to students of ethics, intelligence studies, security studies, foreign policy and IR in general. Jai Galliott is Research Fellow at the University of New South Wales, Sydney, Australia. He holds a PhD in military ethics from Macquarie University, Australia, and was formerly a Naval Officer in the Royal Australian Navy. He is the author of Military Robots: Mapping the moral landscape (2015). Warren Reed is a former intelligence officer with the Australian Secret Intelligence Service (ASIS). Trained by MI6 in London, he served for ten years in Asia and the Middle East. He is a regular commentator on intelligence matters, industrial espionage and terrorism.